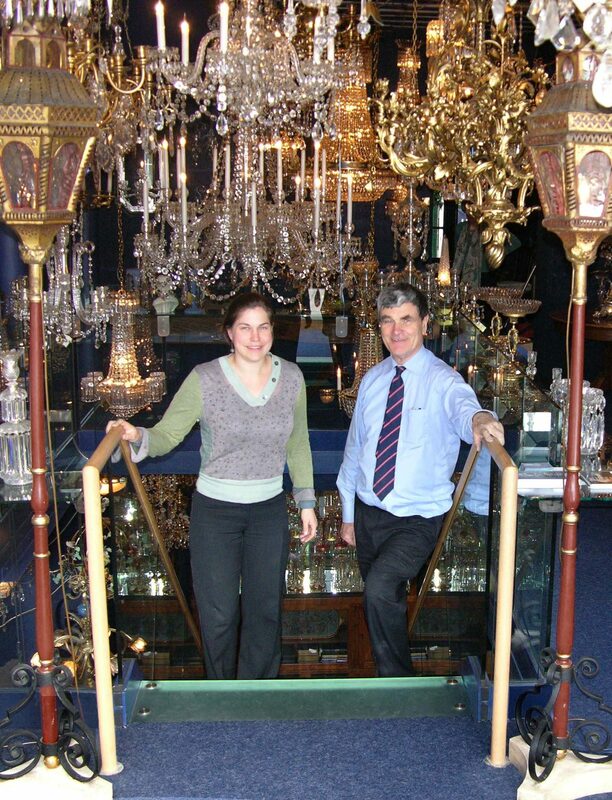 This is the story of two interlinked families who established the internationally acclaimed chandelier shops “Mrs M.E. Crick” and “Denton Antiques”. Mrs Mary Elizabeth Crick opened her first shop in Kensington Church Street (then known as “High Row, Silver Street”) around 1900. Beginning with books, she was one day offered the contents of a library, including the chandelier. Although unwilling, she carried it home on her lap, travelling in a horse-drawn carriage along the cobbled streets of London. 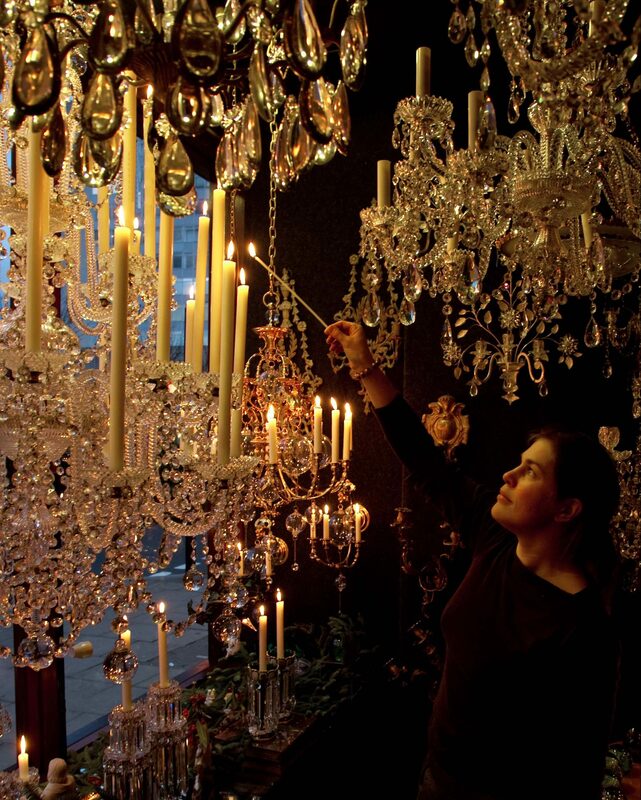 She hung it in her shop and sold it for 100 guineas..
From this success she decided to start selling chandeliers and books side by side. 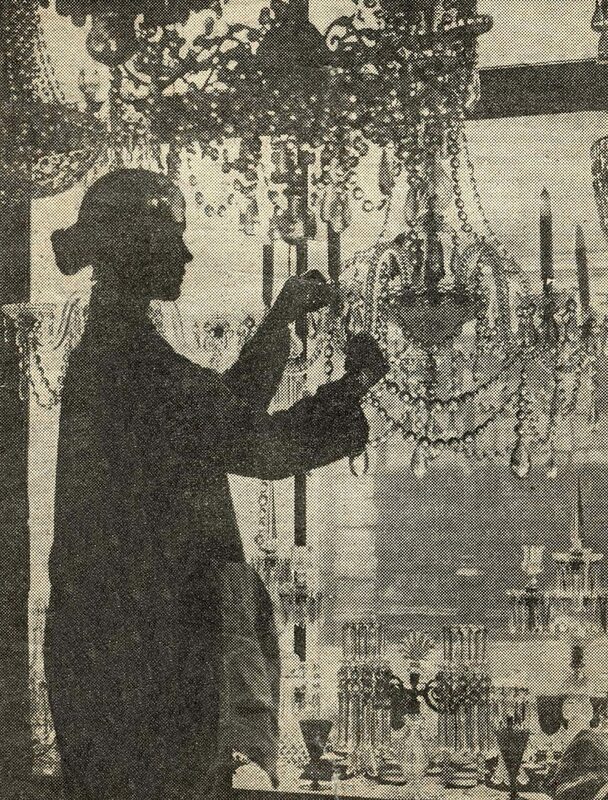 Gradually the chandeliers took precedence over books and they became more popular as she acquired knowledge and experience. At auctions, Mrs Crick would put her latest baby to sleep in an opened drawer while she crocheted and bid. 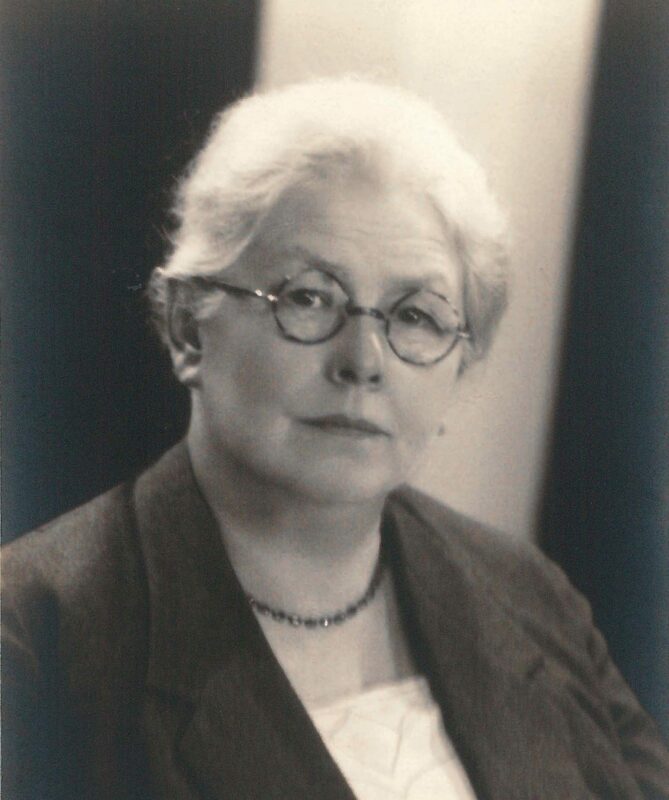 Her family of seven children all played a part in the business, particularly her daughters Elizabeth and Marjorie. 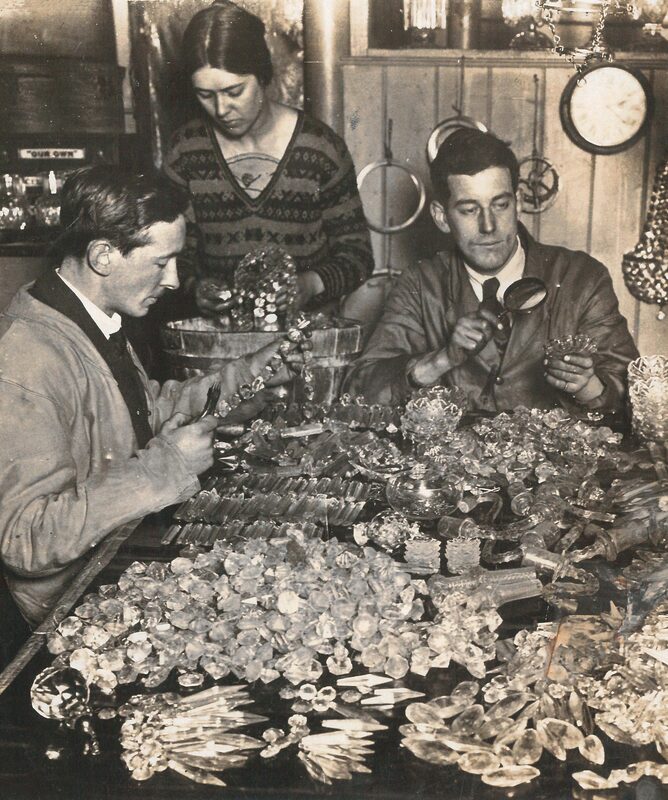 In 1922, the present premises at 166 Kensington Church Street were acquired, where the family were able to live and work. Elizabeth married Kenneth Denton, son of Mrs Mary Tansley Denton, who was in the antiques trade at the same time at 83a and then 87 Marylebone High Street. During the 2nd World War he was a Police Inspector in the Specials at Marylebone Lane, fighting fires during the blitz. Both shops stayed open throughout the war, despite bombing, blackouts and rationing of electricity. Victory was celebrated when the local priest presented a gift of candles and the window was ablaze with light. This was an amazing sight to Londoners, deprived of shop illumination for six years. 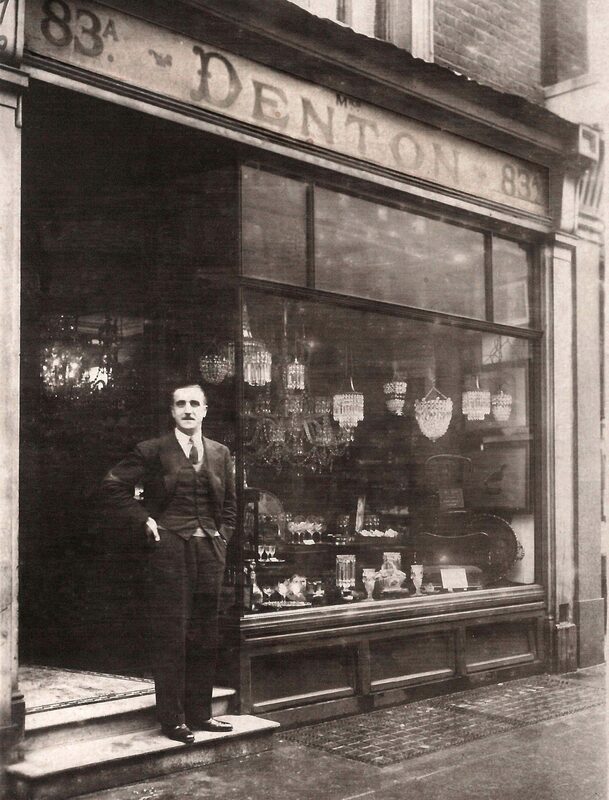 The Denton business moved from Marylebone in 1983 to a new shop at 156 Kensington Church Street, just two doors away from Mrs M.E. Crick’s. 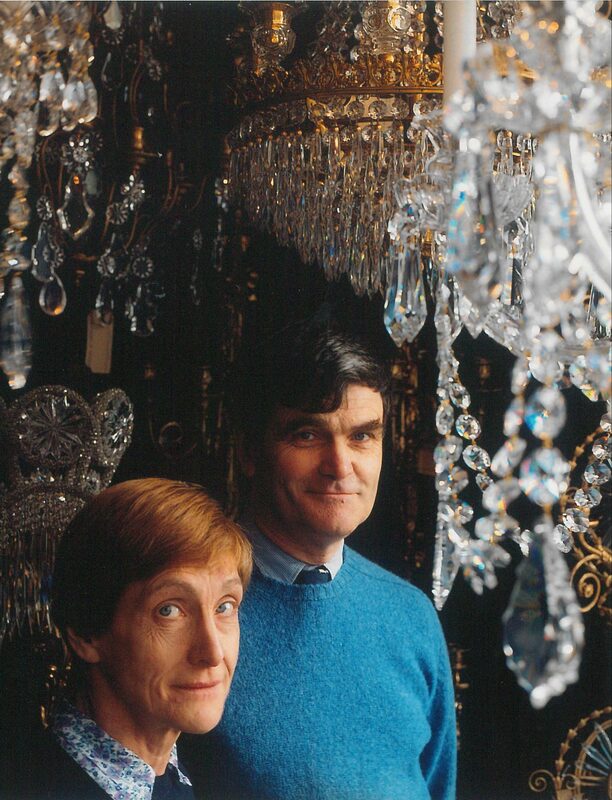 Both shops were run by Mary and Michael Denton, the children of Mrs Elizabeth Denton. Today Michael Denton still runs the business with his wife Avril and daughter Elizabeth. They continue to be surprised by new acquisitions and their history and enjoy serving customers from all around the world. Elizabeth, the great-granddaughter of Mrs M.E. Crick, continues the tradition of lighting real candles in the Christmas window displays.